It’s a little known fact that as well as being the home for Performers, Poppets and many other great things, the Pop In Place is also one of Santa’s many wrapping stations across the land. At this time of year the Elves are extremely busy wrapping presents for the children of Bere Regis and surrounding areas. Once in a while the Elves need to take a break from their important work. In the early hours of Friday 23rd December the night shift was in full swing, when a bit of a commotion began. Curiosity got the better of me and I had to take a look. The Pop In Place is run solely by volunteers, all of the various groups flourish due to the dedication of the teams of volunteers that help. When you click on News and scroll down month on month on this website you can see all the various events that have taken place this year. They are a wonderful reflection of a community that is vibrant and proactive in enhancing the quality of life for all. It is only possible with the help of reliable, enthusiastic and committed volunteers. Thank you all from the bottom of my heart, Happy Christmas. 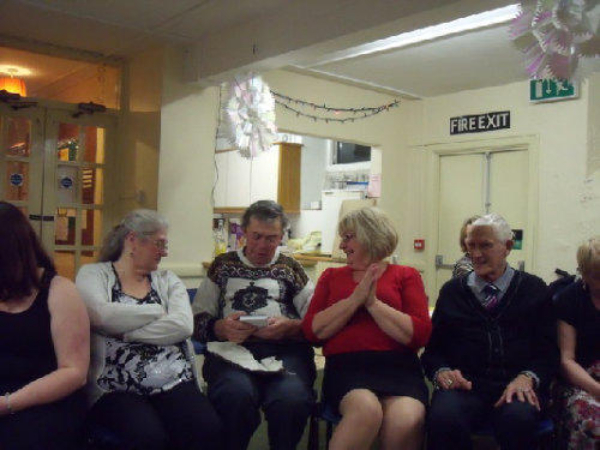 During the evening of the Staff Christmas Party amongst many other party games and the like.We also held two very prestigious competitions one was “Knobbiest Knees” that was won by Colin Vowles and the other “Most Slender Ankles” the worthy winner was Karen Boreham.